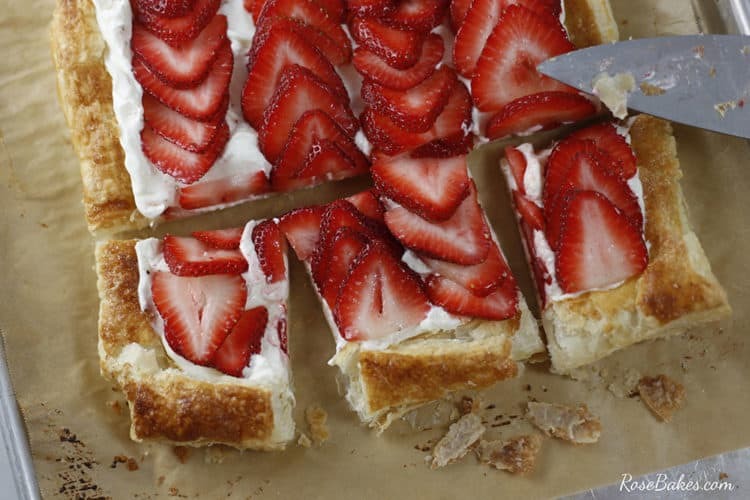 This Fresh Strawberry Tart is a perfectly cool, fresh summertime dessert. Perfect to enjoy at home or even better, take it to a summer BBQ, a pool party or a cookout, and you’ll be the most popular person at the party! It’s funny, as I share this post, it occurs to me that I’ve said a thousand times on this blog… I don’t like summertime. I don’t like the heat or sand or bugs or sunburn or well… most everything summer. But there is one thing… one thing that I absolutely love about summer and that’s all the fresh local fruit that’s in abundance this time of year. It’s almost enough to redeem the season for me (but not quite). Here in Mississippi, summer is just getting started, but I’ve already had four watermelons and cartons and cartons of strawberries. Okay, so I shared with my kids, I didn’t eat four whole watermelons, but you know what I mean. 😉 The watermelons we’re eating straight up cold or maybe with a dash of salt. But the strawberries… oh the strawberries are good this year! 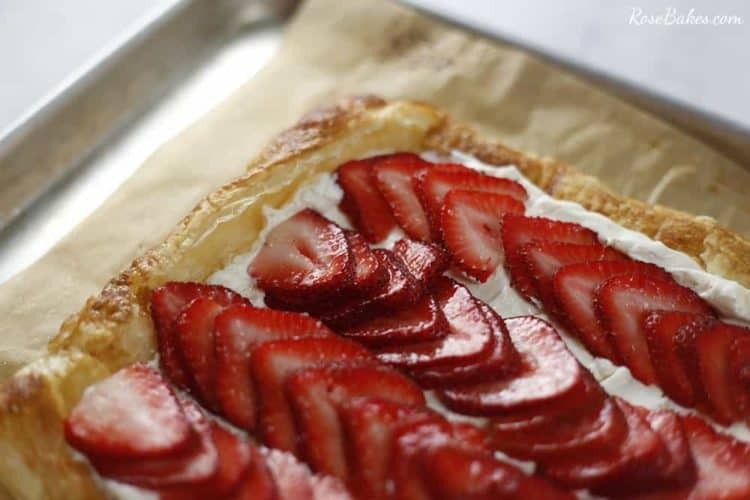 We’ve made strawberry shortcake, strawberry cream pies and just this week… my very first Fresh Strawberry Tart. As much as I hate to admit this, I’ve never actually made any tart before this week. I don’t know why, but I always thought “tarts” were fancy. And fancy meant it must be difficult, right? But I was oh-so-wrong! Now that I’ve made one, I have to say I’m in love. First, the recipe was truly super easy. And then there was the actual dessert. 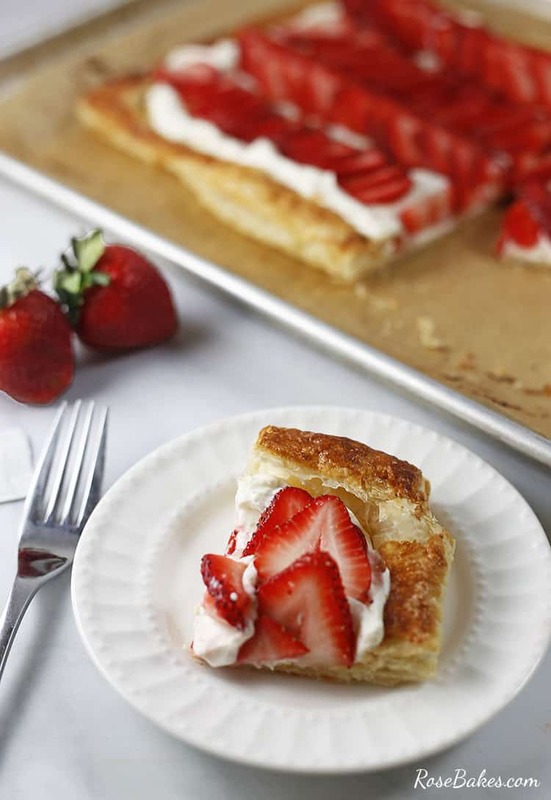 The flaky crust, the creamy center, the fresh fruit on top. What’s not to love? 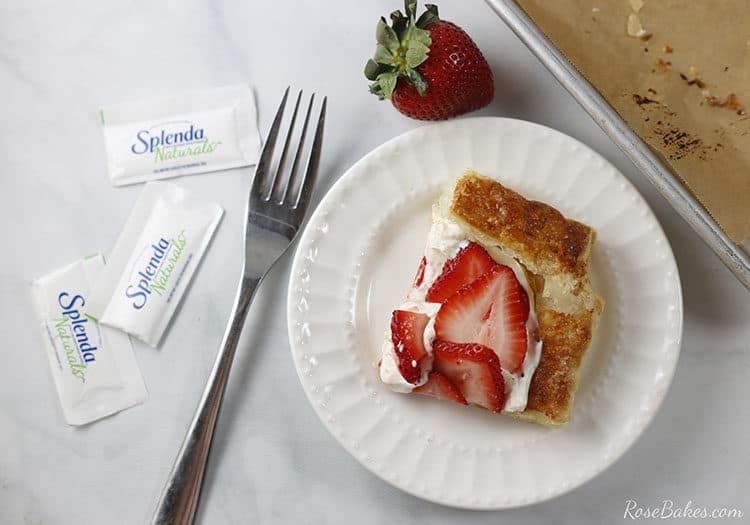 And if that’s not enough reason to impress you, other than a small amount of granulated sugar that I sprinkled over the crust, this dessert is entirely sweetened with SPLENDA® Naturals Stevia Sweetener. And if you are planning to take this dessert to a cookout, you can make it ahead of time and chill it overnight. Then there’s no last-minute rushing around! Alrighty, are you ready for the recipe? There’s a printable version below! Have questions? Leave me a comment! 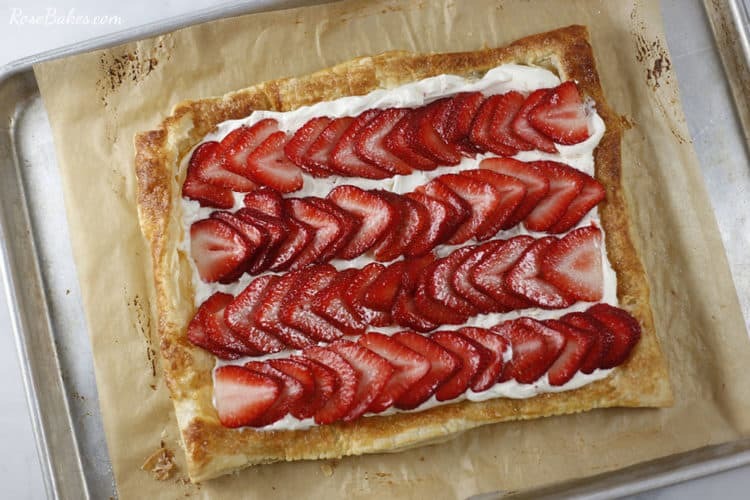 This Fresh Strawberry Tart is a perfectly cool, fresh summertime dessert. Perfect to enjoy at home or even better, take it to a summer BBQ, a pool party or a cookout to share and you’ll be the most popular person at the party! Sprinkle some flour over your surface, then gently unfold the pastry sheet and roll it into a 10″x12″ rectangle (approximately). Transfer the rolled out pastry sheet to a parchment-lined baking sheet, then score a 1-inch border around the pastry without cutting all the way through. Using a pastry brush, brush the border with the beaten egg, then lightly sprinkle with the granulated sugar. Bake for 15 minutes or until golden and puffed. As soon as the pastry is cooled enough to touch (usually just a few minutes), use your hands to gently press down on the center of the pastry sheet to flatten it. Then llow it to completely cool to room temperature (about 15 minutes). While the pastry is cooling, beat the cream cheese until smooth. Scrape down your bowl, then add the heavy cream, lemon juice, and 4 packets of the SPLENDA® Naturals Stevia Sweetener and beat until smooth, scraping down the bowl as needed. Use a spoon to put the cream cheese mixture into the center of the pastry, then spread it out within the borders of the pastry. 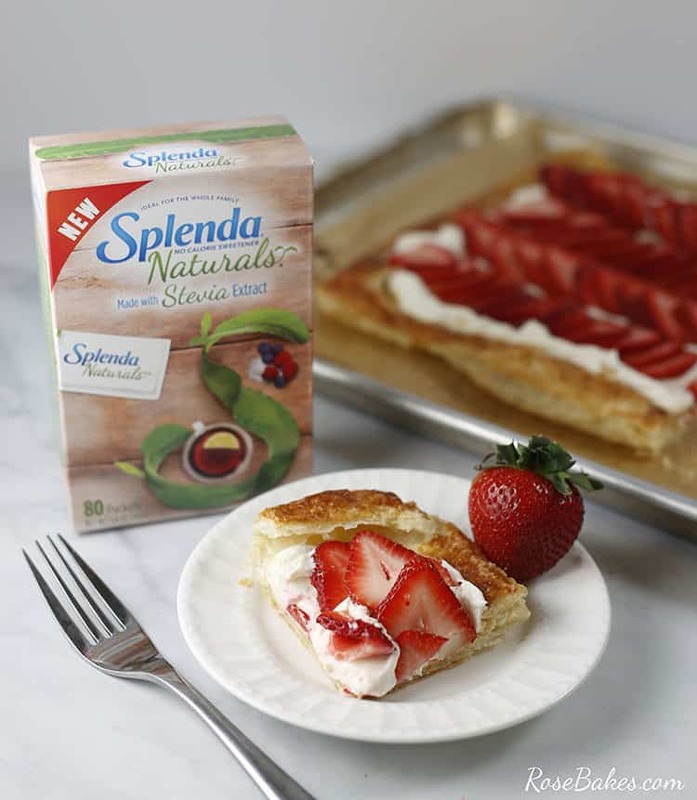 Arrange the strawberries over the filling, then sprinkle one more packet of SPLENDA® Naturals Stevia Sweetener over the top and you’re done! Cut into squares and enjoy immediatley or lightly cover with plastic wrap and chill until you’re ready to serve! 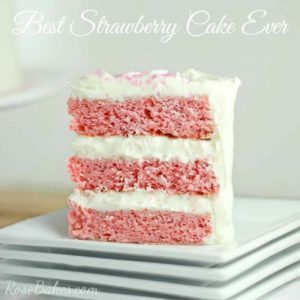 Thank you for the recipe Rose! This sounds lools SO delicious and I LOVE any dessert with strawberries. I do have a question, what is the amount of white sugar would you suggest using since I don’t use Splenda? Thank you and I Love your blog & recipes! It’s really, really good. So you’d use 1 Tablespoon of granulated sugar to sprinke around the crust after brushing with the egg white, then 3 Tbsp. of powdered sugar to mix into the cream cheese and a little more to dust over the top when you’re finished. I’m going to make it this weekend for a special family BBQ. I can’t wait to try it! YUMMY!! This post is Featured at Merry Monday this week and being shared on social media. Can’t wait to see what you share with us next week! This sounds like the perfect easy dessert to make with our 8lbs. of strawberries we just picked. Thanks for sharing on Merry Monday. Pinned and will be featuring this.